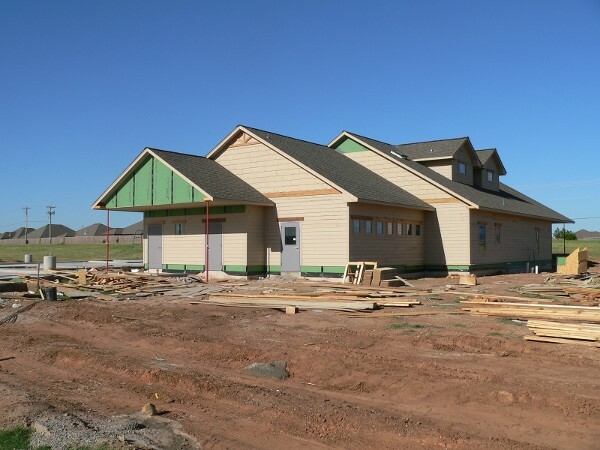 YPCC is building a new clinic! 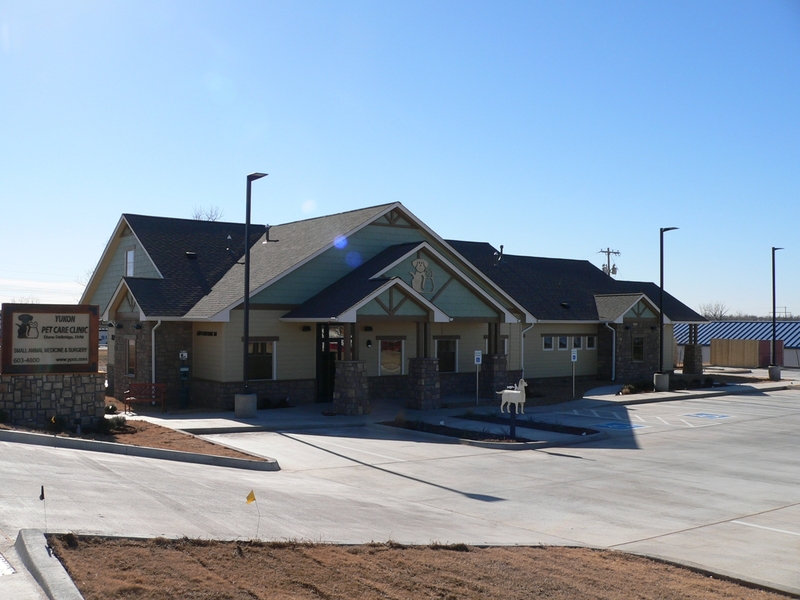 The new address will be 609 N. Mustang Rd, just south of N.W. 10th and Mustang. We will update you here on our progress. 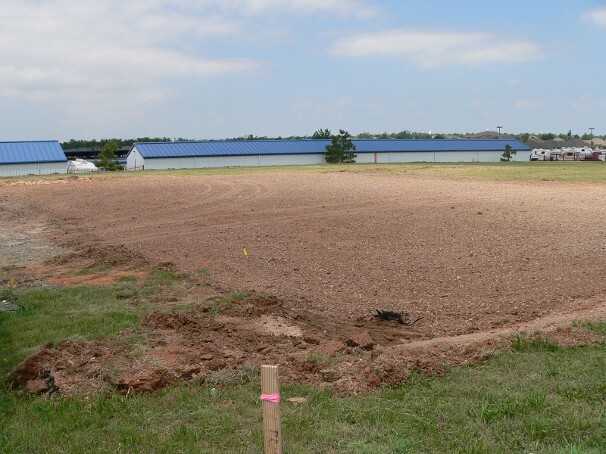 It looks like instead of expanding our current facility to make room for a second veterinarian, we will be building a new clinic. Spanish Cove Retirement Village needs our property for their expansion, so they will help make this possible. We have identified suitable new property that, while not in Yukon city limits, is not far away. We have engaged the services of BDA Architecture to design our new clinic, and they are busy at work. 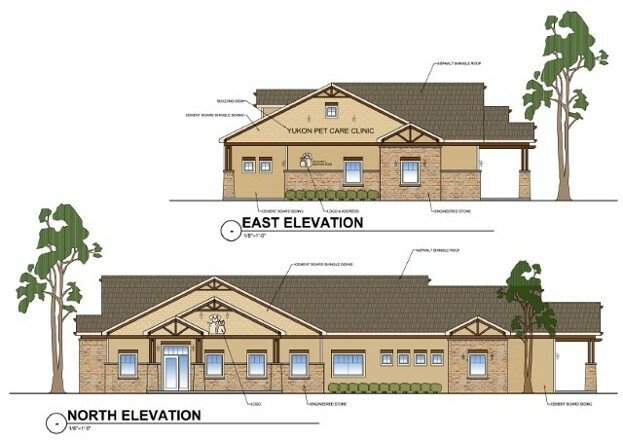 Unlike our current building, which was originally a doctor's office, our new building will be designed specifically as a veterinary clinic. 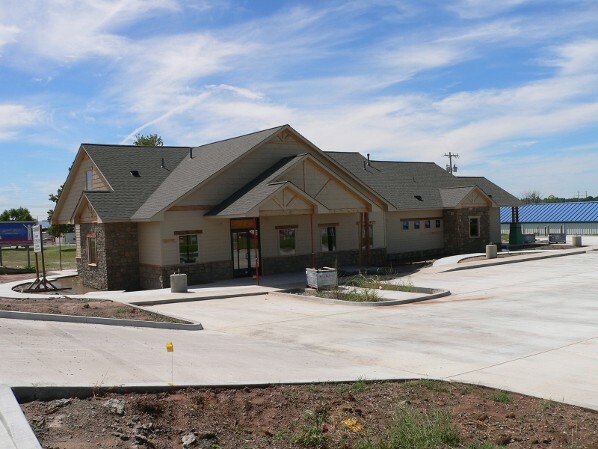 Important improvements will include separate waiting areas for dogs and cats, better traffic flow at the front desk, one more exam room, and better noise and odor control. We will also have a fenced yard to walk the dogs. It will be many months before this is done, but we are excited! 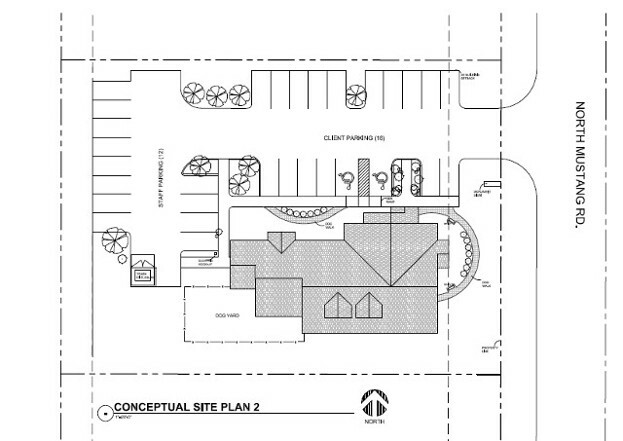 Our architect has provided us with a site plan and some exterior ideas for the new clinic. Many things are happening at once. The final blueprints will be ready at the end of this week, and we will apply for our building permit. The soil tests are done and the civil engineers will soon have their drainage plans ready. A landscaping plan is complete, and a design for the sign has begun. Interior design is almost finished. 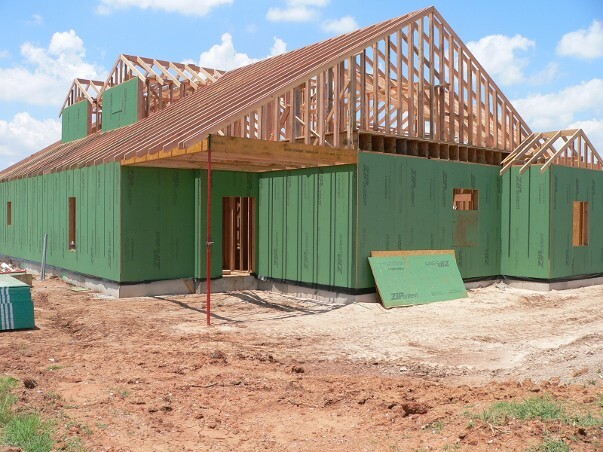 The builder is starting his planning with his sub-contractors. Soon the wait will be on banks and paper work. 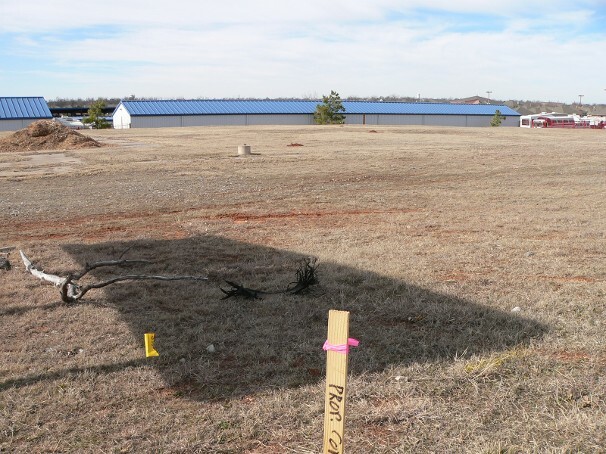 Below is a picture of the new property taken from the southeast corner. Well, after several delays in getting our permit, including having to partially redesign the upstairs offices, we have it and we're getting started. The first step is breaking up and removing the concrete pad and walkways from the old gardening tent location, then we can start moving dirt. We've got a six-month timetable, so we would be expecting to move in around the first week of November, if all goes well. Now we can see the outline of the building. The trenches were dug, the footings were poured, and the forms are up to pour the stem walls. The rebar sticking up in the middle will be in the walls of the tornado safe room. 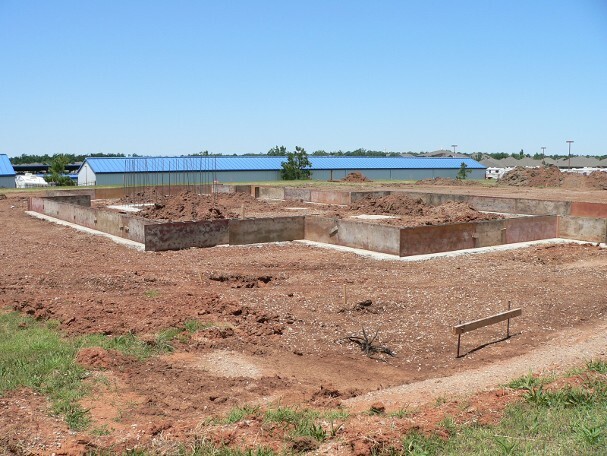 The plumbing is laid, the foundation is poured, some portions of the parking lot are poured, and the walls are going up. 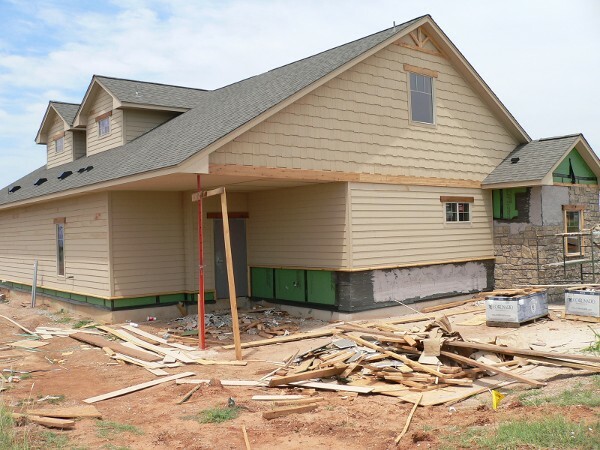 We've picked out stone and siding, and the windows have been ordered. 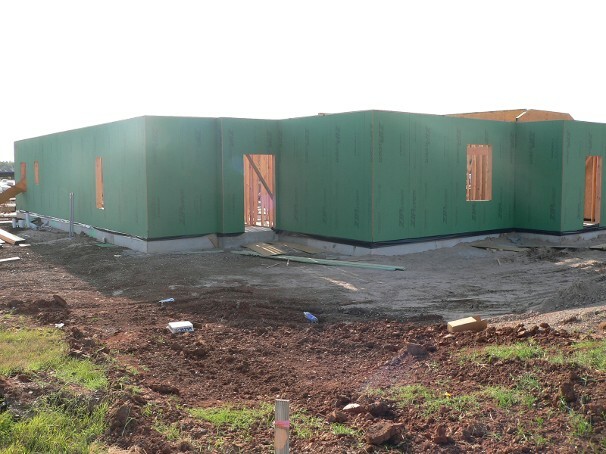 Much of the framing is completed and the upstairs offices are getting roughed in. Now we are getting an outline of the roof, and it is almost time for the windows. The roof is finished, the windows and doors are installed, and the siding is starting to go up. Almost all of the parking lot is poured, and the bases for the parking lot lights are up. Inside, all the concrete has been poured for the tornado shelter, and the above-ground plumbing is being installed. Soon the electricians will start their lengthy stint. This view, unlike the others above, is taken from the southwest corner so the siding is more visible. Almost all of the siding is on, and now the stone is going up. The siding and trim will still need to be painted. The framer has finished the inside walls. We are getting electrical conduit and switches installed, plus heating and air ducts and vents, and lots of exhaust fans for odor control! The flooring and the cabinets have all been picked out. The exterior is almost done - just putting up the porch columns then we'll paint. The porches and sidewalks are poured and the driveway extends to the street. Sorry we had to squeeze down traffic a couple of days for that! 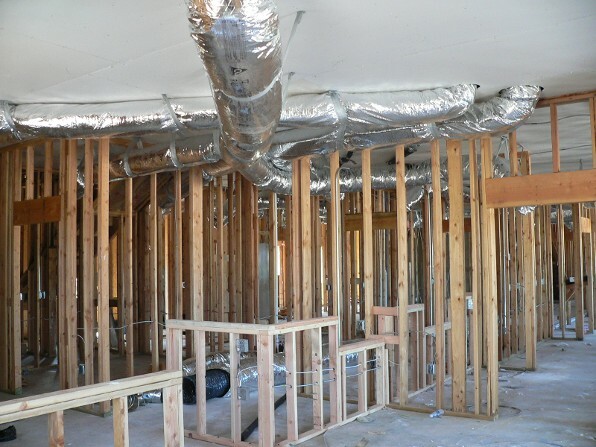 The inside is a maze of conduit and ducts but they will soon be covered by wallboards and ceilings. This first picture is the view from near the street, approaching from the north. 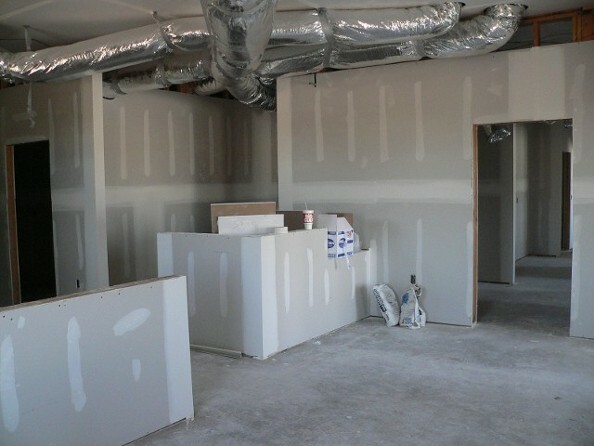 The second picture is of the interior, taken from the dog waiting area towards the front desk. Not much change on the outside, but there is wallboard up on the inside so you can really see the walls. Doors and texture and paint are next. This is the front desk from the dog waiting area, just as above. It doesn't look like we'll make it in the building the first week of November like we hoped, but not too much after that. There is a flurry of activity going on inside and out. On the outside, the irrigation system is laid in, most of the trees are planted, and the shrubs and flowers have been planted and mulched. Our outdoor streetside sign is almost finished. The stone columns on the porches are done. The painters have puttied and prepped for painting and given us some test colors above the front door. The fence is also in place. Painting, grass, and parking lot lights and stripes are about all that are left. Inside, the walls are getting their final coat of paint, most of the doors are installed and stained, the grid for the suspended ceiling is making great progress, and the cabinets have been delivered.Air vent covers, lights, switches and plugs, and cabinet installation will collide with flooring installation as we move toward the finish line. 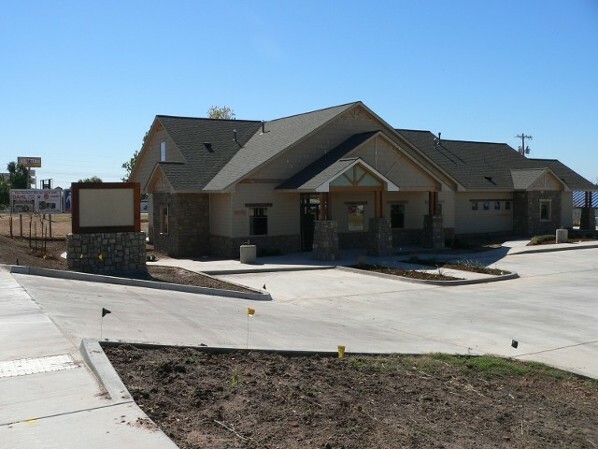 The first picture is the outside from the north showing the sign and landscaping. 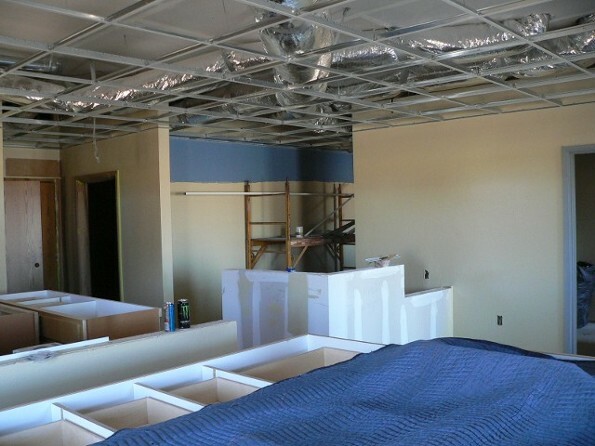 The second picture is the front desk from the dog waiting area, as above, with cabinets stored all around. We're in the final stretch, waiting on last details and inspections. They've been putting in plumbing fixtures, hardware, signage, appliances, benches, and the dog run walls. We have electricity and gas hookups and can turn on lights and use the heater now. The floors and wallpaper are finished and most of the cabinets are done. We expect to get inspections next week, and our permit to occupy the building. 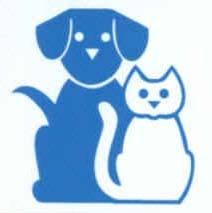 We will close the current clinic at noon on Wed., Nov. 30th and reopen in the new building on Mon., Dec. 5th. Moving will be a massive undertaking, but we all know it will be worth it. I will post more pictures as soon as the outdoor landscaping and lights are finished. We are finally in our new building, and back to business. We don't know where we put everything, or how it all works, but we are learning quickly. There are lots of labels on cabinets and drawers. Not everything is unpacked yet. Our clinic cats are still somewhat freaked out. When we get some sunshine I'll get a good outdoor picture posted. Meanwhile, head over to our hospital tour page where I 've posted several shots of the inside. Thanks to all the wonderful craftsmen who have put this together, and the architects, and our contractor, Larry Alley, and thanks to the staff for all the extra work to have it ready.